Dr. Chen’s expertise in male facial plastic surgery attracts patients to his Augusta, GA-area practice from Columbia and Charleston, South Carolina and the metro Atlanta area. He understands that, although desirable male facial aesthetics share some common goals with desirable female facial aesthetics, there are features that are desirable in the male face that are distinct from females. These differences of what is ideal in the male face versus the female face are what make facial cosmetic surgery in men different than in women. 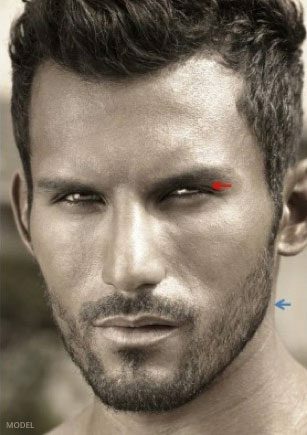 From top to bottom, in the idealized male face, there are thicker and less defined eyebrows and a lower brow position. There is typically more upper eyelid hooding and much less lid show below the supratarsal crease (red arrow in photo). Further downward on the face, a higher nasal bridge with less upward rotation of the nasal tip than in the female nose is very acceptable and often desirable. The male lips are usually thinner than female lips. More lateral or outward projection of the angle of the jaw (blue arrow in photo) and more prominence and projection of the chin are also masculinizing features. As a consequence of these and other distinct differences, the aesthetic goals of facial cosmetic surgery in men is often different than in women. This also holds true for facial rejuvenation surgery in men versus women. During the facial aging process, many of the same features of aging occur in men and women. The brow position lowers, hooding occurs on the upper eyelids, bags form in the lower eyelids, there is volume loss in the midface region, jowls form, a wattle develops below the chin, and fine lines and discoloration of the skin develops. In men, the hairline may recede and the hair density thins. Facial rejuvenation surgery in men must take into consideration the features that are desirable for the male face and the male facial aging process in creating a natural-appearing result. Additionally, in the aging male face, a tight, smooth and overly volumized or filled appearance is not aesthetically desirable. 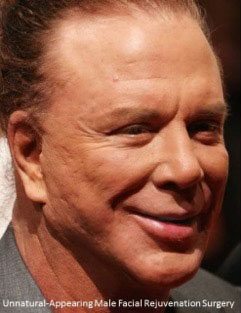 Not taking into consideration the features and aging process that are unique for the male face during facial rejuvenation surgery can create a very unnatural result that may even appear feminized. Request a consultation using the online form to meet with Dr. Chen to discuss your concerns. Or call our office at (706) 210-2625 to schedule an appointment.